I’ve been lucky to have the time and opportunity to play with the AJA CION a little bit. This little beast can offer more than meets the eye… literally. I was welcomed by Andreas and his team at Cineground for a couple hours last week and we tried different setups and settings. I gotta take a moment to say that I am no professional camera operator, I’m a colorist. I don’t shoot movies or light sets. All I can say is that I have a fair knowledge of digital imaging and I go through a lot of different footage every week, trying to pull out the best result out of it. So, that being said, we’ve setup the CION with a Cooke lens that could give us an aperture range going from T2.8 to T22. That way we could play with ISO quite a bit. AJA looked at two very different ways to use this camera. The goal was to maximise time in production and minimise work in post. So, one way to use the camera is to use the different gamma and color correction settings to achieve a baked-in look and go straight to the screen. The other way is to capture as much info as possible in the the files and work on them in post-production. Normal: this is the preferred mode, according to AJA. I found it’s only true if you are shooting for straight-to-TV or if you’re plugged right in the switcher for a live broadcast. It applies a quite heavy gamma curve to the output and discards a lot of the info in the highlights. It really brings out bold colors. The EXTENDED version of the NORMAL gamma puts a softer curve on the black giving it more range but lowering the mids a bit. Then there is the VIDEO gamma that really gives you the EX1 feel and look. Color reproduction is more accurate but not as rich ad the NORMAL setting. Expanded 1 is their kind-of-log setting. It gives a purple-ish tone to the image even if the white balance is done right in the first place. It is useful to see the full range the camera can capture in a glimpse. The thing is that it kinda squeezes the recorded dynamic range in half the codec bandwidth. Most LOG settings like the Sony slog-2 do that. It shouldn’t be a problem if you record in the 12bit ProRes 4444. Finally, I was quite pleased with the DISABLED gamma setting that doesn’t apply any baked curve to the footage. This is the one that gave me the easier “curve” to work with. Maybe because it responds a lot like Canon LOG footage but much darker because it seems to always keep a black point. It also gives more color separation than the Expanded setting. The CION has 4 Exposure Index settings: 320, 500, 800 and 1000. We did lots of our well light tests at 320. At first we questioned ourself on the right exposure because, out the live output in the Flanders monitor, at home, everything seamed underexposed right out the camera. Once we brought back the files in SpeedGrade I found that we had all the info we needed. So, shooting with a preview LUT that pushes the gamma up a bit would not be a bad idea when using the CION. My second tests were done in the camera workshop with a small LED stick. The performance under low light was very nice, even impressive. Very little noise was generated in EI 1000, even after we kicked it up in post. It gave a very soft image that could be easily controlled in the grading room. There too, the use of the DISABLED gamma helped a lot. We did trip on a couple setting as most gamma and color settings will reset when you change EI setting. You gotta be aware that EI settings pretty much determine what gamma curve you can use. When using EI320, you get all the gamma curves available but in EI1000, you only get NORMAL and DISABLED. So, for consistency, you must plan accordingly. Most people who tried the CION were impressed by its weight and the balance with a small lens. It’s alway a trade between a camera that sits low on the shoulder (like the CION) and a more adjustable one that sits higher. Menus are easy to go through once you figure out the sequence. A full screen menu would have helped a bit though. 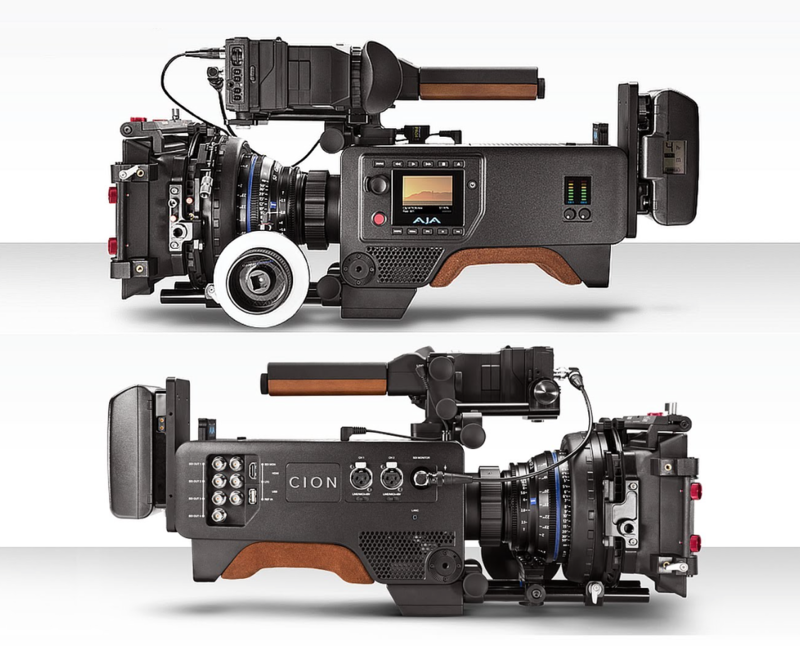 Even if the CION has a 3in LCD on the side, it can only display one line of info at the time because the image is usually taking most of the screen. The AJA CION is a full 4K camera. It can record 4096 x 2160 frames of ProRes 4444 on the proprietary PAK media card it comes with. If you want to go above this 30fps limit you can use ProRes 422 HQ or hook it up to an Io4K that will capture a 60fps RAW feed to your hard disk. If you hook up the 4 SDI outputs to a PC hosting a Kona4 card, you can capture 4K at a fast 120fps in .dng format. We’ll soon be able to use an Odyssey 7Q or an Atoms Shogun to record the RAW output of the CION without having to be punted in a PC. Weird from a company known to build excellent digital recorders. It can also output and record any resolution between that 4K DCI and 1080. It will event give you a 60to30 option for those instant SloMo. The first images I saw from the CION shocked me by their sharpeness. Not as much resolution as sharpness. I even tried to blur them a bit. I quickly found a more forgiving setting and worked my way around that with settings. The VIDEO gamma setting can really bring you back to those EX1 images. I don’t really think you can really use NORMAL or VIDEO images straight from the camera but a little color grading can bring a lot of depth and subtle tone to the EXPANDED 1 and DISABLED shot footage. I don’t give up on the NORMAL gamma yep, I still have to try it on a live-to-tape show and hook it up on the switcher and see how it compares to broadcast cameras. I must say that 95% of what I get in the grading room are log encoded files: slog2, log-C, Canon Log, RedLogFilm. When I get a show shot in REC 709 it always takes me a couple of shot to adjust and adapt to the different effect of my tools has on the footage. It was the same approach with the AJA CION. 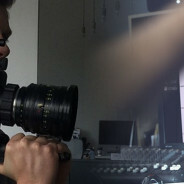 In NORMAL gamma, the footage is much close to the REC709 gamma than to LogC. The thing is that AJA counting on the enormous digital range of the 12bit encoding of the ProRes444 (4096 levels per channel) to retain the hidden information. So, even if you think you are missing much of the low light info, you just have to go and get it. It’s kinda hard to get with the traditional 3-way color corrector. The luma/custom curve is a better tool to stretch the low light range to a proper level while keeping the black point in its place. SpeedGrade users will be able to use the SHADOWS parameters of the Primary tool to pull up the details. So, as the camera seem to only give you the highlight that you see, you don’t get much more overhead than what the monitor shows you. This is one of the only camera for which I would suggest to underexpose a by a stop or two. The files shot in with the DISABLED gamma setting seem to have a much more balanced highlight vs shadow falloff. In NORMAL, highlights looked straightly cut while giving shadows a extremely slow falloff. The DISABLED gamma is different from what we usually play with but is a nice approach to gamma mapping. As mentioned above (and in the manual), the EXPANDED 1 gamma setting is giving the shots a washed purple tone resulting in a funny straight-to-Instagram look. This cast can be easily adjusted by balancing black and white point. But I was surprised that is wasn’t applied equally across the range. Once balanced, this is pretty close to an LogC. This will make your colorist happy. If you can get your hands on an AJA CION, make sure to download the manual and the quick reference guide. This 2 page summary is your quick introduction to this unique and affordable 4K camera. It is also very easy to get your hand on a CION. AJA has the TryCion program. You go on their website, apply online and if you qualify they will send you a loaner CION to evaluate. I now have to put my hands on a PC system with a KONA 4 card to test the RAW footage this camera produce. I’ll keep you posted as this should happen before the end of July. NORMAL_to_709: to scavenge the shadow info in NORMAL gamma footage. The ZIP contains all the LUT (16 points) types SpeedGrade can export so they should be compatible with everything: HD Link, Clipster, Baselight, DaVinci Resolve, SpeedGrade, Photoshop, Premiere, Avid Media Composer. So download and enjoy! Nice and interesting review. Could you further elaborate about the resolution vs. sharpness?